GOES GREAT WITH ANY TOY GUN (sold separate). SIZE 16 = fits 16 to 21"
SIZE: 18 = fits 18 to 23"
SIZE: 20 = fits 20 to 25"
SIZE: 22 = fit 22 to 27"
SIZE: 24 = fits 24 to 29"
SIZE: 26 = fits 26 to 30"
SIZE: 28 = fits 28 to 32"
SIZE: 30 = fits 30 to 34"
Child real LEATHER * DOUBLE * GUN holster, all leather with tooling - ( We also offer single gun holsters)- in Childs Toy section. This is the same exact holster as our adults, only in a child size. This double gun holster belt for kids comes in tooled leather Black or Cherry Brown. 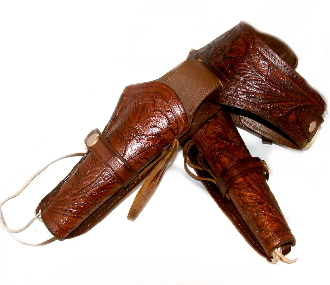 Real leather pistol holder for two guns made in the kids sizes but just like the adults. There is no difference between Dad or Grandpa's gun holster and and this one made just for a toy gun or a real pistol. HARD TO FIND ITEM- DETAILED TOOLING- HOLSTER FOR KIDS.